Located in The Forest Greens by the 2nd tee box of the Challenge Golf Course. Close to everything fun - sports center, pool, golf, bike riding, miniature golf, etc! Gorgeous views and private back deck facing golf course, makes for a relaxing stay. 3 bedrooms, 2 1/2 baths. 2 HD TVs & 2 other TVs, 2 DVDs, 1 VCR, stereo, hot tub, propane barbeque, fully equipped kitchen. Eagle Crest offers biking trails, 3 outdoor pools, 1 indoor pool, and 1 kids splash park, 2 sports centers, full service spa, 3 beautiful golf courses, etc. 6 passes to Eaglecrest sport center facilities available (where passes are required). Located directly across from the 2nd tee of the Challenge Golf Course. Looks out on the 2nd tee of the Challenge Golf Course. The beds and bedding are all top quality ~ as nice as home. Crock pot, waffle maker, coffee bean grinder, etc. Dishes for indoors and outdoors. 2 bar stools at bar also. One smart TV in living room, one large TV in upstairs bedroom plus DVD player in living room and bedroom. Wifi available. The Eaglecrest Sports Club pool, indoor pool, is 2 blocks away - within walking distance. 3 other pools close by. 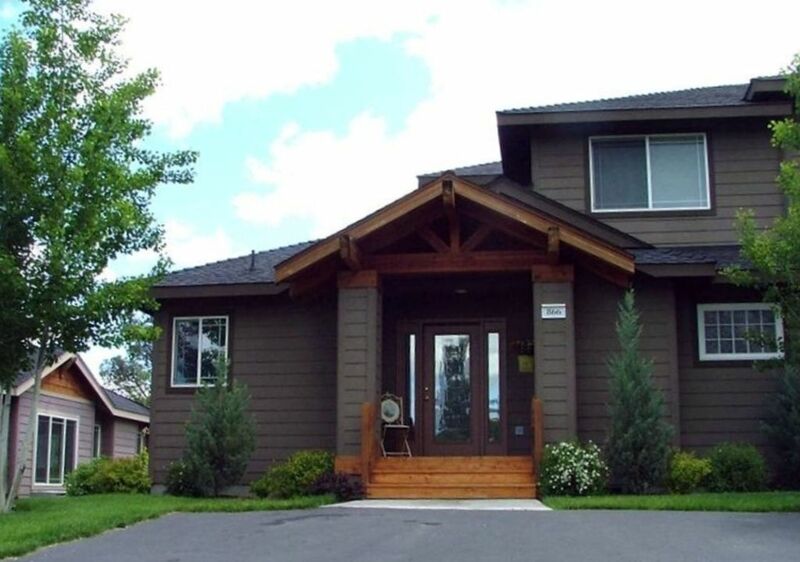 Serene setting, upgraded furnishings throughout, lots of parking, within walking distance to all the amenities, great view of golf course and Mt. Jefferson. Nice home - enjoyed our stay! Enjoyed our stay, would stay again! Property was clean, well appointed and easy to find. We were able to navigate between the rental properties of other families attending the reunion and staying at Eagle Crest and use the resort amenities with them. Close to the family reunion picnic area in Tumalo State Park and for floating the river. Lot's to do. Next time we would bring bikes, golf clubs and stay longer. Thanks! Glad u had a good time! Everything was clean and in great condition. The unit was unusually well stocked with all the little things that are too easy to forget. We hope to stay there again. Thanks for your review. Hope you’ll come again! Home was clean and well taken care of. would stay there again. Plenty of room and very comfortable. Pictures don't show how much space this home really has! Wished we had patio furniture out back on the nice days/evenings but overall it was an excellent stay. Great view out back! Comfortable beds. Plenty of towels, soft blankets and room to hang out. I’m sorry my patio furniture wasn’t out yet. I came over after your stay and brought out the furniture. Next time just let me know and I’ll let u know how to get into the storage room where the furniture is stored. Thanks! We have a great stay with two families and owener very quickly responsive. Thank you for your comments😊�! Hope you’ll come again! During "off" season (other than holidays), stay 4 nights, get 1 night free. During "peak" season, stay 7 nights, get 1 night free.